Educators problem-solve the complexities of introducing a new concept to students by participating in new workshops centered around STEAM and maker movement practices. The 20 educators who signed on to participate in the Western Pennsylvania Writing Project’s 21st Century Notebooking Inquiry Project, a Grable-sponsored exploration into paper circuitry, dove straight into “doing,” trying out firsthand what they intended to teach others. The group represented various contexts: public, private, and charter, and nearby Latrobe, Hempstead and Franklin Regional districts. Paper circuitry, at its most basic, involves tinkering with copper tape, sticker LED lights, coin-shaped batteries, paper, pens, and art supplies to design and compose written texts that light up. 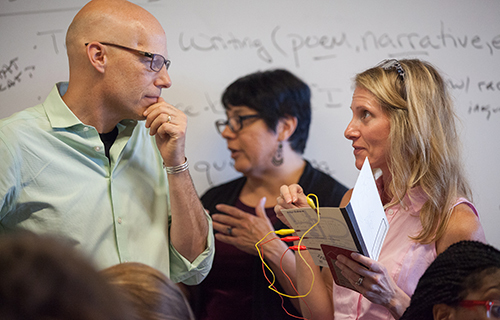 This group, and a larger group of invited visitors, experienced his or her own “lightbulb moment” during a July 2015 two-day workshop held at the Writing Project’s four-week Summer Institute for Teachers, which helps teachers across grade levels and disciplines strengthen their literacy practice. The paper circuitry workshop was led by San Francisco-based David Cole, of NEXMAP. NEXMAP, which stands for “New experimental music, art, production,” is a transformative educational non-profit organization that works to create innovative opportunities for teachers and students. In the workshop, educators were curious, largely inexperienced learners navigating the unchartered waters of paper circuitry. By immersing in the learning experience first, as their students would later, teachers reminded themselves to allow space and patience for mistakes, questions, experimentation, and discovery of this new form of multi-modal composition—in keeping with National Writing Project ways. Multi-modal composition is a term for the kinds of texts we generate in a digital age—which we often need to “design” by intentionally weaving writing, visual images, and code together to express our thinking. Support from the Grable Foundation, as well as the National Science Foundation, and the National Writing Project—which powers the Educator Innovator initiative with funding from the John D. and Catherine T. MacArthur Foundation—permitted the Western Pennsylvania Writing Project (WPWP) to bring in an outside expert, equip the participants with kits of materials for their students, and set up venues for collecting photographs and data. Educators agreed to check in and meet up during the first three months of the school year. The participants are teaching in classrooms, afterschool, and museum programs, working with students ranging from second grade to high school. By talking across levels and situations, they have been able to problem-solve some of the complexities of introducing a new concept. The entire project offered a marvelous opportunity for Western Pennsylvania Writing Project to consciously play with, and inquire into, the maker movement and STEAM practices. 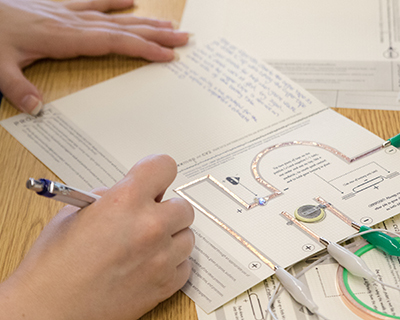 Cole, a pioneer in the field of paper circuitry, scaffolded the educators’ learning by using cardstock template notebooks that directed the use of copper tape, alligator clips, LED lights and flat circular batteries. Each person created a continuous circuit that would result in the lighting up of the notebook. Each cardstock notebook directed users to jot their thoughts, questions, and ideas about the process. Cole then facilitated discussion about how individual educators might use paper circuitry in an instructional unit to enhance their students’ learning. In August 2015, the 21st Century Notebooking Inquiry group convened to discuss their plans, identify resources, and receive a kit of materials. The educators making this deeper commitment have been introducing paper circuitry into English and literacy, Spanish and science. Despite the differences in settings and in student ages, most teachers found their students to be receptive and interested in understanding and utilizing paper circuitry. 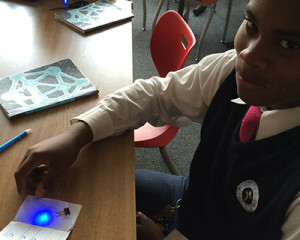 While some classes created simpler paper circuits such as lighted nametags, others explored in-depth projects that required problem solving and critical thinking skills, such as how to test a battery or light once the product has already been constructed. At Kentucky Avenue School, experienced “maker” teachers Aimee Defoe and Bob Gerwing involved their second and fourth graders in a constellation project, which required research, writing, designing, soldering, and more. Many educator participants identified paper circuitry as an opportunity to collaborate with teachers of other subjects to enhance student understanding of multi-disciplinary approaches to learning. The 21st Century Notebooking Inquiry project has served as a natural springboard for teacher-leaders to emerge within their schools while tinkering with multi-modal composition in the form of writing and flat copper tape, tiny batteries, LED lights, and microprocessors.